Martinaire Aviation is a Texas-based air cargo carrier that has been providing delivery services and plane maintenance services for over 30 years. Their fleet consists of 29 Cessna Cargomaster planes servicing over 40 cities throughout the United States, which includes their facility in Lansing, MI that is located next to the Capital Airport. Pat Jemison, Martinaire’s Director of maintenance, top priority for the facility, is the safety of his crew and providing ideal working conditions. Jemison has a maintenance staff that works around the clock six days a week making sure the Aircrafts are in perfect working condition in the field. Monroe Dodge Chrysler Jeep Ram Superstore, has been a family owned and operated auto dealership since 1966. 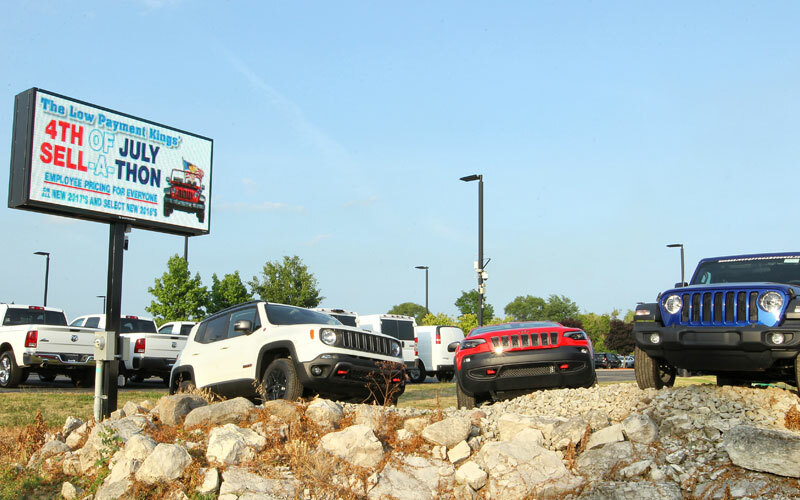 Since their dealership is located on a busy street, with a lot of traffic, they wanted to take advantage of their location so they decided to explore the process of adding an LED sign to their current signage at the location. A couple of challenge’s they came to face were learning that they had to rezone some of their property to allow for additional signage, as well as wait for the city of Monroe to lift their ban on LED signage. The Dow Event Center is an entertainment venue in Saginaw, MI, managed by SMG. The venue hosts a multitude of events. From banquets, to sports, and from conferences to concerts, this venue can support any function for entertaining. With the Dow center hosting many events, they want to make sure that their customers feel safe entering, and exiting the event they are attending. They started receiving complaints about the parking lot lighting levels, so they started looking into options on how to improve the lighting as well as save on energy as well. Electro-Matic came in to do a light survey in the parking lot, and the results were the below the foot candle and IES standard. Their current lighting was outdated, and the poles were placed very far apart. The Dow Event Center, SMG and Electro-Matic needed to work together to increase the light levels and decrease the energy usage and obtain safe entrance for customers attending events. Electro-Matic had to design, a lighting system using various optic controls to spread the light and reach the IES standards. A photometric design was created and presented to both Saginaw County and the Dow event Center. Once the drawing was approved, the lights were manufactured, permits were pulled and the lights where installed. The Dow Event Center increased the Foot Candle levels by a third and decreased their energy by two-thirds and the customers now have safe light to attend events. A season ticket holder of the Saginaw Spirt hockey team, was more than impressed with the improvement: “As a season ticket holder, I have never felt safer entering the arena to watch a hockey game with my kids’. Harvest Barn Word of Life Church in East Jordan, MI decided that it was time to move on from Incandescent lights and install LED lighting. Electro-Matic Visual , A+ Lighting Solutions, and City Sign Erectors were able to supply and install their new LED lights to cut their energy bill by over 75%. The significant energy savings comes from Harvest Barn Church removing their previous 108 – 500 Watt incandescent lights and replacing them with 40 high efficient 178 Watt LED lights. This is where LED lighting makes traditional light look silly. LED lighting is able to use significantly less energy, with less fixtures and provide a better quality and brightness of light. Electro-Matic Visual found A+ Lighting Solutions to be the best fit to supply the lighting fixtures for Harvest Barn Church. After the correct fixtures were chosen, the lights were installed by City Sign Erectors to complete the job. Not only is Harvest Barn Church going to benefit financially from the future years of energy savings, but they also experienced an outstanding rebate incentive from Michigan Saves and Consumers Energy by switching to LED lighting. Their rebates totaled to be approximately $15,000. Harvest Barn Church may use their rebate money to continue to improve their Church by adding an LED sign in the near future. Starbucks is known for their premium coffee, espresso, lattes. With over 13,000 Starbucks locations in the United States, Starbucks has become one of the most recognizable brands today. The Starbucks located in Saginaw, MI was recently opened, but before it was ready for its grand opening, Starbucks wanted the inside and outside of their building to welcome and comfort customers. That’s where Electro-Matic Visual came in to provide Starbucks with LED lighting to meet their requirements. As you may have noticed, most Starbucks have great architecture and other high quality aesthetics. LED lighting is the perfect compliment for great architecture, as it highlights the buildings strongest points and gives customers and guests a sense of welcoming and comfort. 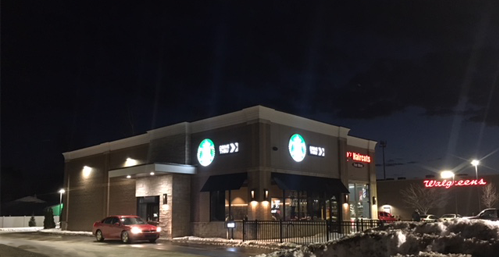 The Starbucks of Saginaw, MI has been enjoying and benefiting from their LED lighting, provided by Electro-Matic Visual, since late 2017. Starbucks is amazed by how the building looks and will be benefiting from the LED lighting for years to come. Wilson Town Center is a premiere power center located in Wyoming, MI that features some impressive tenants including: Best Buy, Bed Bath & Beyond, Marshall's, Michael's, Subway and many more. The large property had traditional lighting and was expensive to operate. Wilson Town Center made the switch to LED lighting with Electro-Matic Visual to reduce operating costs, improve customers’ experiences, and overall safety. Electro-Matic Visual was prepared for replacing a total of 55 fixtures that needed to be replaced with high quality LED parking lot lighting. 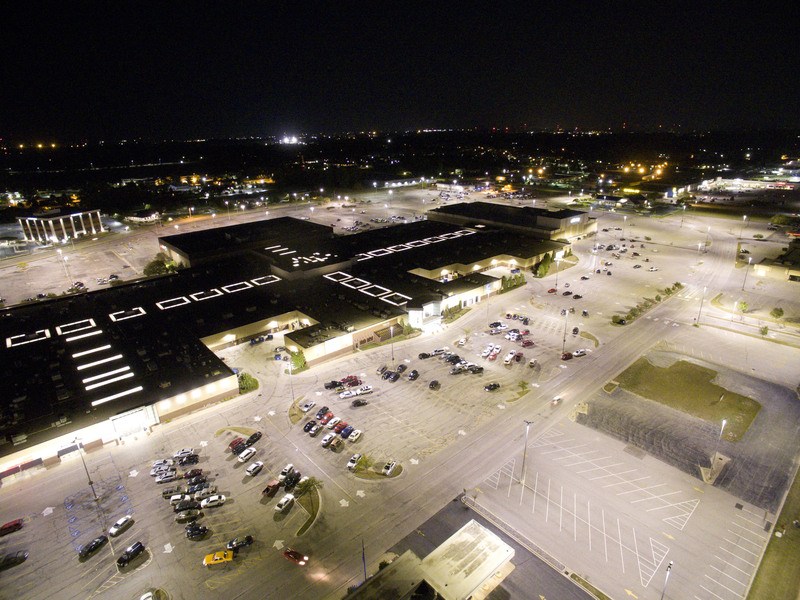 The LED parking lot fixtures now illuminate the 230,506 square feet that Wilson Town Center resides on. Wilson Town Center previously had (40) 10,000 watt metal halide fixtures that were replaced with (40) 270 watt LED parking lot lights. In addition, they replaced (15) 400 watt metal halide lights with (15) 120 watt LED parking lot lighting fixtures. In both cases, they are seeing increased lighting levels and significantly reducing their energy usage. The benefits don’t stop there. 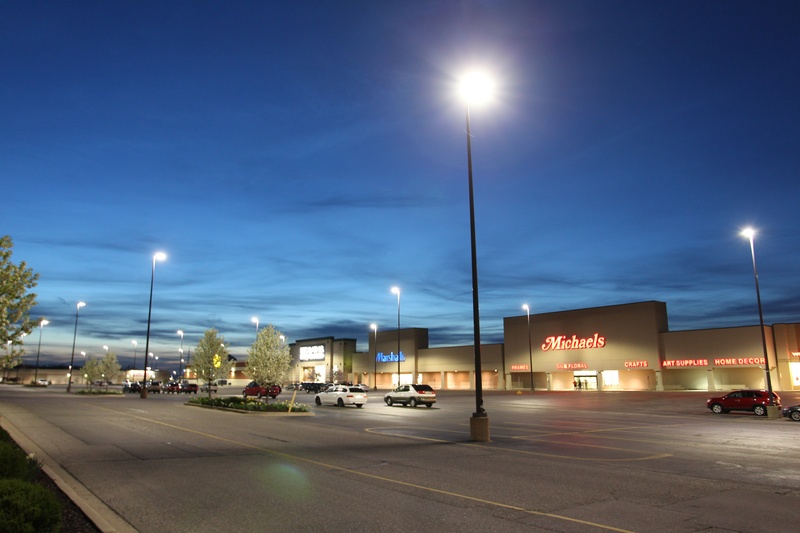 Wilson Town Center’s energy provider gave them a $17,000 rebate on the LED parking lot lighting fixtures to help cut initial costs of the fixtures. Also, Wilson Town Center was given an additional 20% off since Electro-Matic Visual builds all of their LED fixtures in Michigan. Wilson Town Center will see immediate financial benefits on their energy usage and will see an ROI of just over one year! 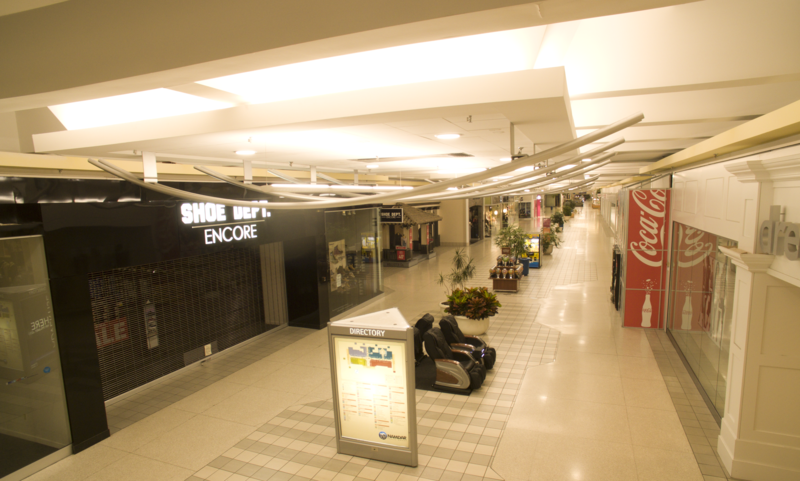 Fashion Square Mall of Saginaw, MI, as we have talked about before, has installed both interior and exterior LED lighting to improve their facility and reduce their operating costs. In this post we will focus on just the interior application and what benefits are being seen from converting from LED lighting. Smart lighting is designed for ultimate energy efficiency and is a great compliment to LED lighting. Smart lighting wireless controls are the next big step to further benefit from LED lighting. Electro-Matic Visual’s wireless controls and application experience can enhance energy savings with LED lighting. These wireless controls allow dimming profiles to optimize energy consumption with lighting requirements and is just one of many ways smart lighting can optimize your ROI on LED lighting. Smart lighting also includes motion-sensing controls and when integrated correctly with LED lighting the savings can be even more substantial. Motion sensing can be paired with wireless on/off control to automatically turn off individual lights or sections of lights. Motion sensing is also an ease of mind technology. Since the lights are turned on with motion and turned off with lack of motion, you no longer need to worry about shutting down after the day or setting up timers. Smart lighting allows you to get numbers and reports on current draw, hours of usage, voltage functions and other data so you can see what areas you can improve on to maximize your lighting efficiency for your application. Fabiano Brothers is constantly moving beverages in and out of their facility. Proper lighting not only on the inside was needed, but the importance of having their loading docks equipped with quality LED lighting wall packs was necessary to have their hundreds of trucks load and unload safely throughout each day. Backing in a 18-wheeler to a tight area with precision can be daunting for semi-truck drivers. Doing it with poor lighting turns that task into a nightmare. Understanding of their semi-truck drives challenges, Fabiano Brothers decided that implementing LED wall packs to help guide the drivers into the loading docks. The optic throw that the LEDs use pitches the light forward off the wall and on to the desired area to help make the path to the loading dock visible for the drivers. Wall packs were not just used for the loading dock, they also fit the needs for other applications around the high bay doors that the semi-trucks would enter and exit for picking up shipments. The wall packs acts as a guide light for the drivers, giving them visibility when entering or existing the doors. After business hours, wall packs are and good lighting in general, are necessary for providing good security. Security cameras that are placed outside of the building would be irrelevant without good lighting. By strategically pitching the light, the wall packs create enough light for security cameras to record at high qualities.